For the team at 2020 Exhibits, creating attention-grabbing, awe-inspiring environments and events isn’t limited to the trade show floor. In fact, when it comes to creating compelling, inspiring and brand-focused events and environments that not only capture but captivate the right attention, they’re award-winning pros. When planning their own year-end celebration, the stakes were high—this could be no average affair. With unprecedented growth, success and expansion ranging from a new facility opening in Viva! Las Vegas to their new office and showroom in Sweet Home Chicago, to record-breaking sales and unprecedented new client acquisition through RFPs and Word of Mouth, coupled with the growth and expansion of their expertise and global offerings in A/V and interactive technologies, it was time to celebrate. 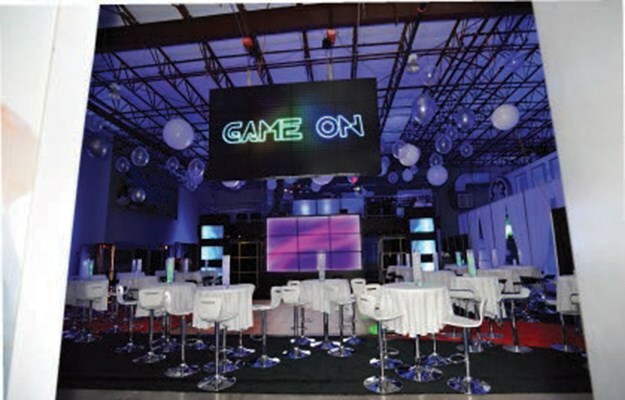 Using their 2020 Exhibits Houston headquarters and 10,000 square foot showroom as the backdrop, the focus became generating fun and excitement by maximizing interactive and innovative technology assets of more than 100 rental a/v screens across the showroom. High ceilings made for an ideal space to “light up the night” with pre-programmed, fully orchestrated bright and brilliant LED lighting backing iridescent balloons, which were artfully suspended like stars in the sky. For the 150 all-star guests there was something for everyone with new-school interactive games such as Wii and Xbox Kinect vying for attention against the old-school favorites such as Air Hockey, Donkey Kong, Ms. Pac Man and Hoops Fever Basketball. Friendly competition was found over at the Microsoft’s Xbox Kinect’s Sports Zone, where friends and colleagues went head to head in running, kicking and passing challenges. From the first beat until the last, popular music filled the airwaves as DJ Manny spun music with American Idol moments found in the fun and interactive rounds of “Name that Tune” (three notes, really?) 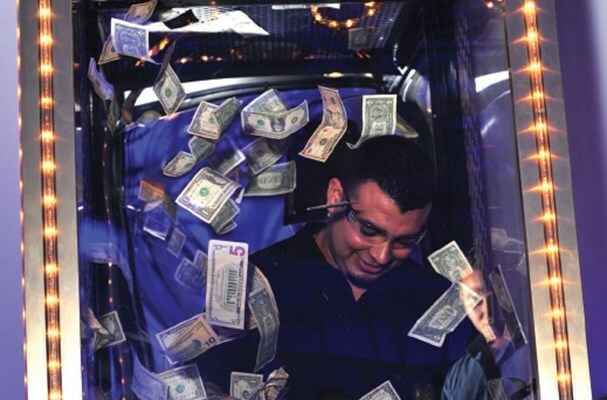 along with fast-paced, inspired performances in the “Money Machine”, where party goers could don safety goggles and try their best “cash capturing” moves as bills swirled around them. 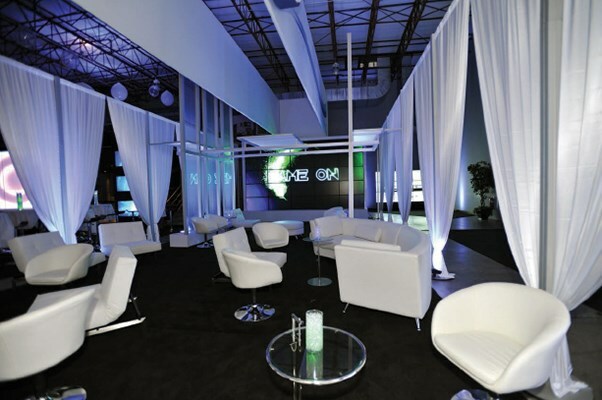 If new gaming systems just weren’t up your alley, party goers could kick back and relax in the upscale VIP lounge, which was bathed in soft colored lighting and draped in seductive white sheers. 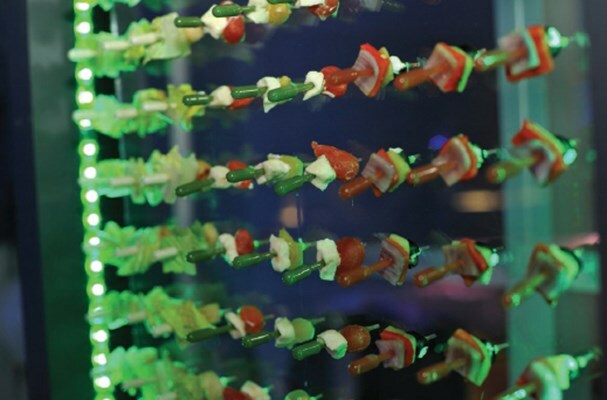 Located just steps away from the sumptuous buffet and catering stations, which featured 6-foot high glass wall stocked with fresh flavor-infused light appetizer bites, guests comfortably moved from space to space. For those seeking more interaction and engagement with their friends and colleagues, everything was just steps away from the packed dance floor. So how does 2020 Exhibits keep the momentum going? More sound, more light and drive as the team passionately tackles worldwide expansion, bringing the excitement and energy of an event like GAME ON to clients across the globe.